Following approval from Germany's conservatives to cooperate with the Social Democrats (SPD) on several political impasses, German Chancellor Angela Merkel sat down with Germany's RTL Aktuell where she discussed a number of policy positions - including an acknowledgement of Germany's growing "no-go" zones, and the need to do something about them. 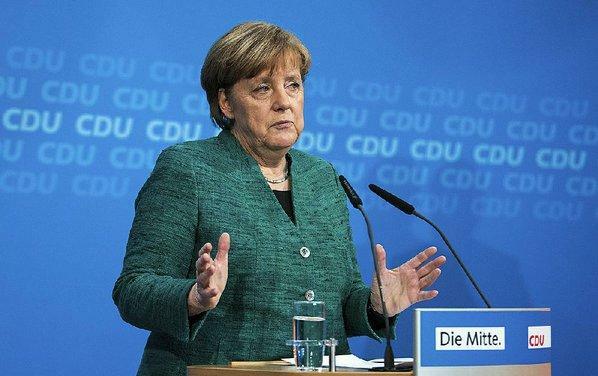 Amid a spike in crime attributed to refugees, German officials been slowly acknowledging the negative impact of the flood of migrants taken in after the destabilization of Libya and similar regions - even going so far as to offer thousands of Euros to rejected asylum seekers. "That means, for example, that there are no no-go areas, that there can be no rooms where no one dares to go, and there are such spaces, and you have to call that by name and you have to do something about it. And I think that Thomas de Maizière did a very good job as Minister of the Interior, but we also said now that we want a model police law, we can not stand by the different security standards in different states and that needs to be as unified as possible"
Following the dramatic influx of primarily North African migrants, several German publications have documented the growing problem of "no-go" zones - areas in which it is unsafe for non-Muslim citizens to travel. The newspaper, Bild, and the newsmagazine, Focus, among others, have identified (here, here and here) more than 40 "problem areas" (Problemviertel) across Germany. These are areas where large concentrations of migrants, high levels of unemployment and chronic welfare dependency, combined with urban decay, have become incubators for anarchy. In an article entitled "Ghetto Report Germany," Bild describes these areas as "burgeoning ghettos, parallel societies and no-go areas." They include: Berlin-Neukölln, Bremerhaven-Lehe/Bremen-Huchting, Cologne-Chorweiler, Dortmund-Nordstadt, Duisburg-Marxloh, Essen-Altenessen, Hamburg-Eidelstedt, Kaiserslautern-Asternweg, Mannheim-Neckarstadt West and Pforzheim-Oststadt. "In Berlin or in the north of Duisburg there are neighborhoods where colleagues hardly dare to stop a car -- because they know that they'll be surrounded by 40 or 50 men." These attacks amount to a "deliberate challenge to the authority of the state -- attacks in which the perpetrators are expressing their contempt for our society," said Rainer Wendt, President of the German Police Union. There are plenty of other stories which seem to never make their way into the European mainstream news outlets, which have been documented by groups such as the Gatestone Institute. "Once Duisburg-Marxloh was a popular shopping and residential area. Now clans claim the streets for themselves. The police are powerless. The descent of the district is nightmarish." — N24 Television. Police say they are alarmed by the brutality and aggression of the clans, who are said to view crime as leisure activity. If police dare to intervene, hundreds of clan members are mobilized to confront the police. A 17-page report prepared for the NRW State Parliament revealed how Lebanese clans in Duisburg divide up certain neighborhoods in order to pursue their criminal activities, such as robbery, drug dealing and extortion. "Further data collection is not legally permissible. Both internally and externally, any classification that could be used to depreciate human beings must be avoided. In this respect, the use of the term 'family clan' is forbidden from the police point of view." — Ralf Jäger, Interior Minister, North Rhine-Westphalia. Two police officers stopped a driver who ran a red light. The driver got out of the car and ran away. When police caught up with him, they were confronted by more than 50 migrants. A 15-year-old attacked a policeman from behind and began strangling him, rendering him unconscious. So while Europeans were tricked into accepting an army of migrants under the guise of a humanitarian effort, liberal EU leaders are finally coming to grips with the fact that the spike in crime associated with their new "neighbors" isn't going over too well with local populations. And while the EU has gone so far as to criticize Poland, Hungary and Bulgaria for not accepting migrants - Germany is, at the same time, finally addressing the very "no-go" zones that have made life a living hell for German citizens who dare enter.